I was on my way to meet you a few weeks ago when I took this picture. It was a Tuesday and we were going to see each other after being apart for almost close to a week. I was running late so I took a cab because every minute saved on travelling is another minute I get to spend with you. 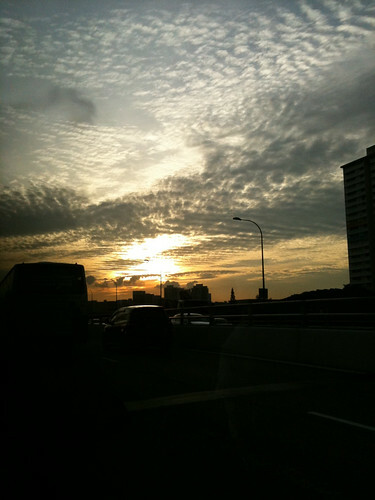 We were speeding along the expressway when I saw the sky covered in a golden sheen. It was nearing the end of the day and I was going to see you in a few minutes’ time. But you were still on my mind and this was a perfect moment to show you why. I know I was born and raised here but there are still times when new malls keep sprouting up and most places remain unfamiliar to me. Now that I have finally settled down in Singapore permanently for the last three years, moments like this make my heart soar when I see how beautiful this city can be at times. I am enjoying my life here, and it’s not just because of the free laundry and cooking services I get at home. This finally feels like home. I know right.